Focus: To learn and understand how Facebook Ads can increase your reach and help you get new clients. 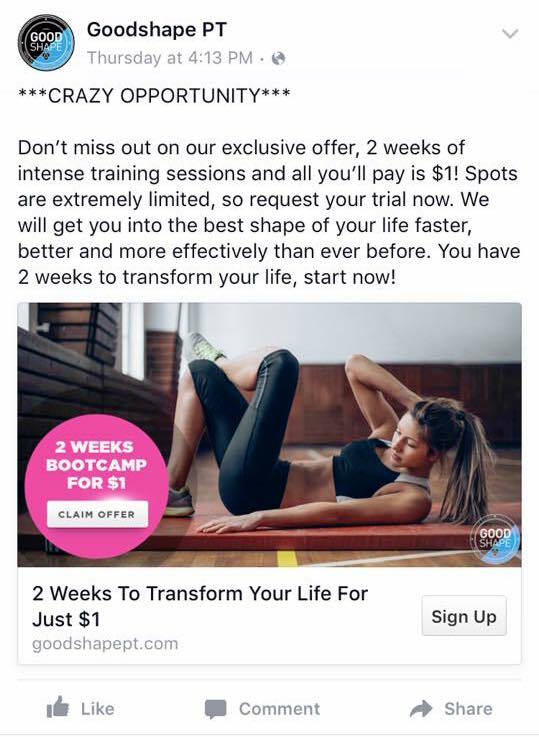 In this lesson you'll learn how to create Facebook ads for your personal trainer business, when to use ads and how to get a bigger return on investment. Let's face it. Anyone can create a Facebook ad in just a few seconds. The trouble is, there are many options and choices available to advertisers. Selecting the wrong ones, or bad combinations, can lead to poor results. It's vital that you know what is available to you and how best to use those resources. There's no denying that Facebook offers a powerful online advertising platform. The aim of this lesson is to show you how to harness that power! Here is what you need to know in six easy steps. Step 1: Understanding Facebook Ads. Without a doubt, Facebook is the world's leading social network. It boasts over one billion active users worldwide each DAY on the platform. Facebook ads are a means for you to advertise to people in specific areas, with specific interests and at specific times. For example, you could create an ad for people in your area interested in WeightWatchers and then send another ad to the people who were interested on your first ad! While Facebook advertising is cheap, costs can spiral out of control if campaigns aren't managed well. 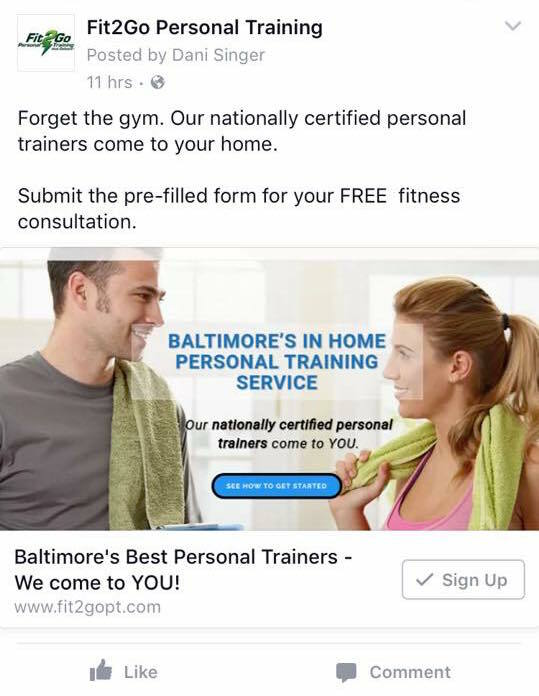 Personal trainers need to know how to create targeted ads that return good results. And, of course, run campaigns that keep costs down. As with most things in the tech world, there is a lot of jargon and terms you must get to grips with. The Facebook advertising platform is no exception! The good news is that you don't need to dedicate half your life to learning about them. 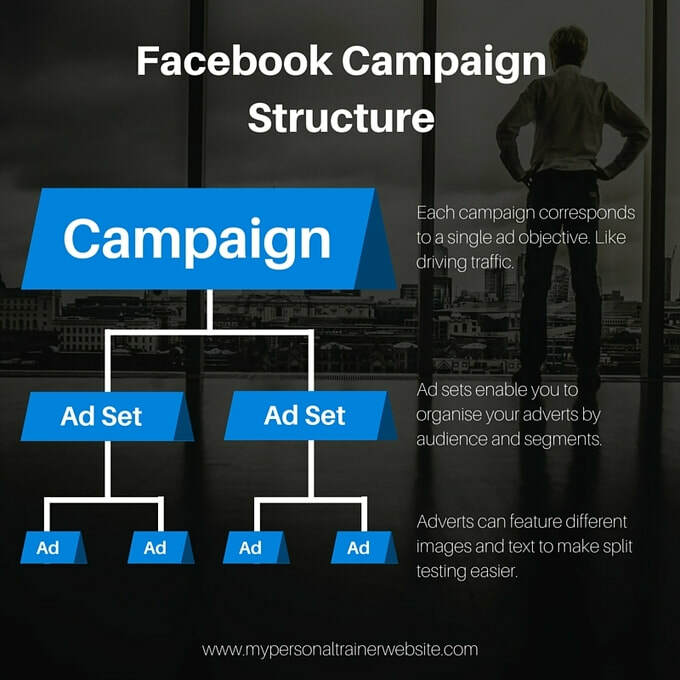 So, how does the Facebook advertising system work? ​1 - Campaigns [books]. These are the structures that house the other elements. Each campaign should get created for a particular objective. For example, one for the post-Christmas advertising example I mentioned earlier. And you could create another for summer fitness goals, and so forth. 2 - Ad Sets [chapters]. They are useful for defining ads that you want to target to different audiences. For instance, you could have one ad set for seasonal fitness promotions. You could also have another for obtaining new likes, and a third for directing people to your website. 3 - Ads [pages]. These are the 'creatives' that you use for each ad set. You can have more than one ad per ad set (in fact, I encourage you to do that). When you proceed to create a new Facebook advertising campaign, you'll get asked to choose an objective to help you tailor your ads for a specific purpose! Interruptive/Outbound - This type of marketing consists of paying to have your ads displayed in front of people who don't know, like or trust you. It's the ad equivalent of throwing as much poo at the wall as possible and hoping something sticks. But, if you get your targeting, offer and follow up right, you'll get new clients. 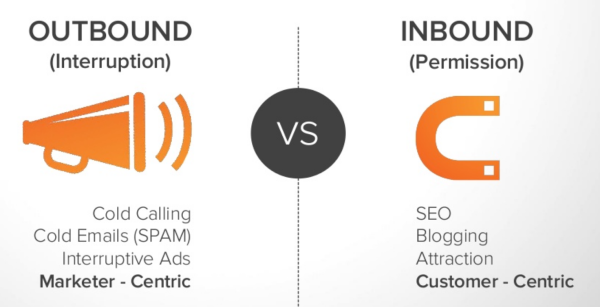 Permissive/Inbound - Inbound marketing is all about being Mr Helpful. It certainly doesn't yield the fast ROI of an outbound ad but the long term benefits far exceed the short term gains. Permissive marketing involves offering to help people with blogs, guides and answers to questions and then gently channeling those who are ready to buy toward the relevant pages. These types of ads are ideal if you need to get a Facebook post more attention. For example, you created a "like" or "share" competition. This is simply social proofing. likes used to hold power and more likes meant more engagement, but now you need to pay for engagement so the only reason to pay for likes is to boost your social status. This is the most often used ad. Use this type of ad to get clicks to a subscribe page for email opt ins or to promote a product. Never send them to your home page and always create a page specific to the ad. This is similar to website clicks except it requires a Facebook Pixel to measure how many people "converted" in to a subscriber or a buyer. Self explanatory. This is website conversion ads but for apps. Same again. Website conversions but using engagement as a metric. Facebook will help you refine a local audience for this one. It's a good ad type to use if you're a beginner PT promoting local services. If you've created an Event you can advertise it using this type of ad. Facebook will charge you based on how many people click "attend". This si great for one time offers. Particularly of low value products like an eBook. Video Views. A practical way to tell customer stories or promote new services via video. Again, self explanatory. If you need more people to see your ad, this is the ad type to use! Sometimes it can be tricky to determine just who IS your target audience. After all; you want everyone to use your services, right? The thing with Facebook ads is that you only want to target people most likely to take an interest in you. Of course, you might have more than one target audience. For example, you may only cater to a particular age group. Or people with particular interests or lifestyles. There will be a little experimenting needed on your behalf at this step. The good news is Facebook makes it easier to determine your campaign's target audience. ​They have an audience definition gauge that shows your potential reach. So, you may want to remove some limits on your choices to reach a broader group. Or you might wish to target a different audience entirely. 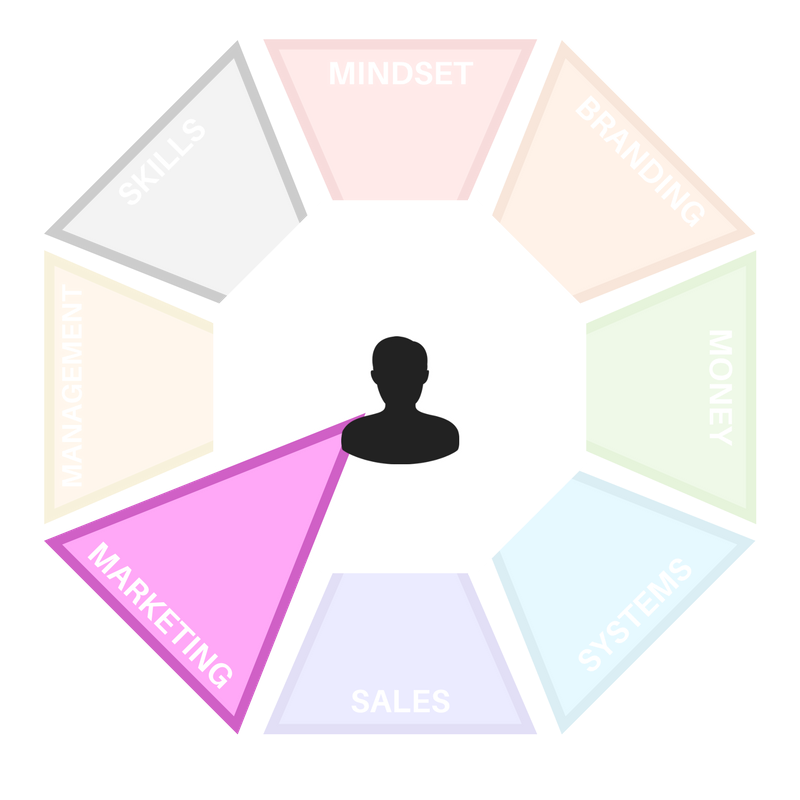 There are many ways that you can target your audience on Facebook. Obvious choices like location, age range and gender are available as you would expect. Other selections available include education, work, and hobbies. You can even target people that 'like' individual interests too. Be sure to spend some time finding the perfect audience so you don't waste time and money later on. Once you're done, you can save your audience settings for future campaigns. Now it's time to consider how much you wish to spend on your Facebook advertising! These days, the social network offers a plethora of budget options to suit your needs. For example, you can set a daily or 'lifetime' budget for your campaign. The former allows you to set a maximum daily limit. And the latter is useful if you only wish to run a campaign for a given period. Bear in mind that your daily limit should be more than £5. Believe it or not, you get quite a lot for your money with such a small amount! And it goes without saying that the more you spend, the broader your reach and the bigger your results. Facebook also allows you to refine your budget requirements further. One option is to set a date and time schedule for your lifetime budget. Another is to optimise how your ads get displayed. With Facebook, you are bidding for ad placements much like you would with Google ads, for example. You can choose whether to bid by objective, clicks or impressions. The latter is the number of times your ad gets displayed. I recommend letting Facebook set optimal bids for you within your budget. It's ideal for new users. Plus, it means you don't have to adjust your ad budget settings continually. The bonus is that you'll end up spending less on your Facebook ads over time. Now comes the fun part: creating your first ad! As you can imagine, your ad should be relevant to your campaign and what you do. The way that your ad gets displayed will depend on your objective. Visuals: Use of the right images is imperative. For example, if your target audience is stay at home mothers, an image of a 21 year old Crossfit athlete is not ideal, nor relevant. Relevance: If you're showing ads that aren’t relevant to your target audience, then you're wasting your time and money and will likely not see success with any kind of advertising. 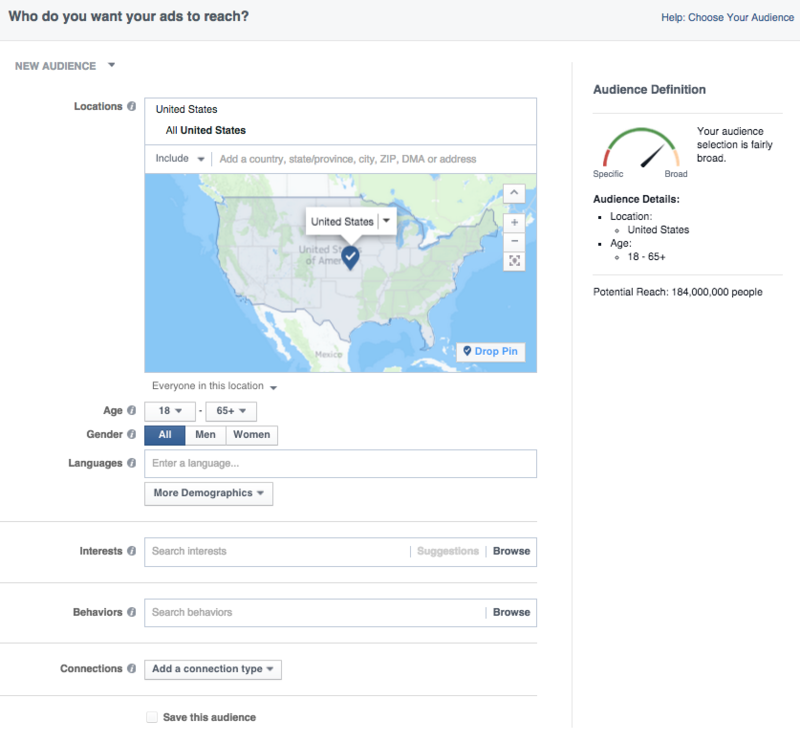 Facebook recently launched a new feature in the Facebook advertising platform that rates your ads and gives you a relevance score, similar to Ad Rank in Google AdWords. The more relevant your ad image, ad copy, and destination page is to your audience, the higher your score is -- and the more favorably Facebook will treat your ads. Value Proposition: ​A value proposition tells the reader why they should click on your ad to learn more about your product. How is your product or service different from any other? Why should the viewer click on your ad to see your website? Call to Action: A beautiful and relevant ad is great, but without a call-to-action (CTA), your viewer might not know what to do next. Add a CTA like “Buy now and save X%,” or “Offer ends soon” and add a sense of urgency to your viewer. Your CTA should encourage people to click on your ad now. 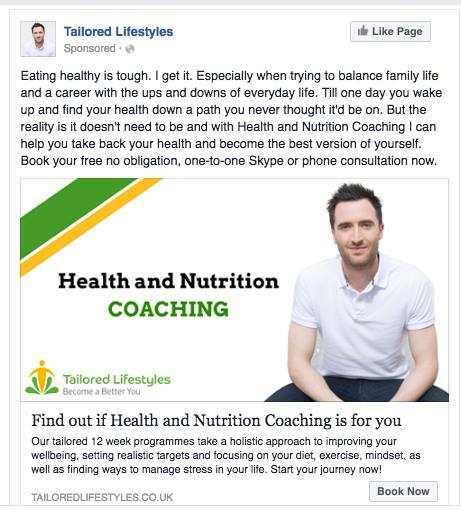 ​The brilliant thing about Facebook advertising is that you can have up to 50 ads per ad set. I recommend creating a variation of ads and not just sticking to a single one. You can use different wording, different images and so on. Over time, you can see which ads perform the best from your selection. The reason this ad works is because the image instantly lets you know what the ad is about. This means that Goodshape PT didn't have to use any sensitive words like "fat loss" or make assumptions about the audience. use of sensitive words and making assumptions about the reader of your ad will get an ad rejected. The image contains a face which almost always draws attention and it's immediately obvious what the ad is about. Those that are interested in nutrition coaching will read the copy and those that aren't won't waste their time or Tailored Lifestyles' money on a click. The reason this ad could work so well is because the copy is short and sweet but more importantly, suggests the user will spend very little time filling out their details. ​Last, but not least, it's important to track your ad campaign performance on a regular basis. Doing so is a good idea for several reasons. First of all, you'll find out which ads perform well and which ones to stop. Second, you can measure the effectiveness of your campaign. And, third, you can keep track of your ad spending so far. You can do all that using the Facebook Ad Manager interface. It's a slick and easy to use system that offers plenty of reporting tools. HOW MUCH SHOULD I SPEND ON MY CAMPAIGN? ​The answer will depend on how much you can budget towards your Facebook advertising. Compared to newspaper ads, Facebook advertising is much cheaper and offers better targeting. Spending at least £150 a month is a good place to start. WHAT HAPPENS IF I WANT TO STOP ADVERTISING? 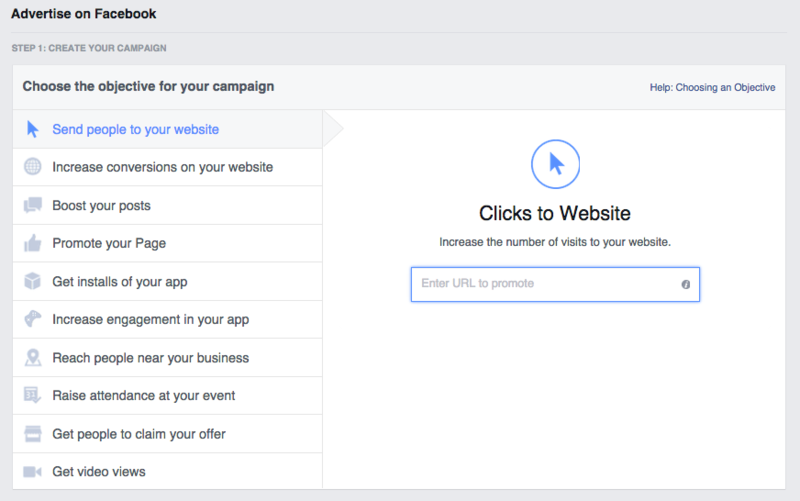 If you log into the Facebook Ad Manager, you can pause campaigns, ad sets or individual ads. Yes, it's possible to have several campaigns and ad sets running side-by-side.